Award-winning science writer Jennifer Ackerman investigates the endless mysteries of genetics, offering an elegant natural history of humanity as seen through the lens of our genes and cells. Combining the gifts of vision and language with in-depth knowledge, Ackerman explores the ways in which, at the most fundamental level, humans are genetically linked to every part of the natural world. 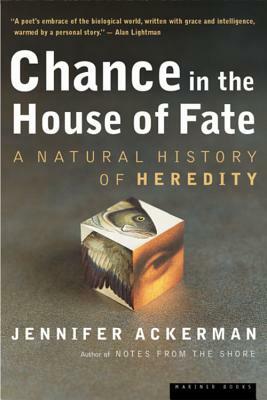 CHANCE IN THE HOUSE OF FATE is a rich and often personal tour through the surprising turns of heredity, informed by the ways genetic inheritance has affected Ackerman's own life. From a younger sister's profound retardation and her mother's illness to the births of her own healthy daughters, Ackerman reveals her own experiences as telling touchpoints, ultimately illuminating the the hidden biological connections among all forms of life. Jennifer Ackerman is the author of Notes from the Shore and Chance in the House of Fate. The recipient of a grant from the Alfred P. Sloan Foundation and literature fellowships from the National Endowment for the Arts and the Bunting Institute of Radcliffe College, she writes for National Geographic, the New York Times, and other publications.